Why are there no smartwatches or fitness trackers at MWC 2018? Where's all the techy wristwear? Smartwatches and fitness trackers are nowhere to be seen at 2018's biggest mobile tech show. We’ve been scouring the floor and tapping our contacts to find interesting wearable tech announcements, but there's almost no presence of tech you can put on your body at the show. Mobile World Congress has never had wearable tech as its main focus, but it's the show major brands have used to reveal smartwatches and fitness trackers in the past. Recent years at MWC have been quiet for smart wristwear announcements - last year's show only saw the reveal of the Huawei Watch 2 - but it's unheard of to, well hear nothing. MyKronoz is by far the biggest sole wearable tech company at the show, but the firm isn't showing off any new products. Instead the booth for the brand is showing off the MyKronoz ZeTime Petite, a device it launched two months ago at CES 2018. But what about the big brands that provide wearable products alongside other – largely more important – offerings. Huawei chose a different tack this year compared to previous shows and announced computing devices like the Matebook X Pro as well as the MediaPad 5 tablet range instead of a flagship phone or smartwatch. We spoke to Huawei's CEO about the brand's choice not to reveal a watch at this year's show, and he confirmed a new smartwatch is coming but it's not ready just yet. Richard Yu, CEO of Huawei, told TechRadar, "It will come later - there's no hurry - because Huawei Watch 2 sells well, so we're not in a hurry - so we're launching the new watch later." The most exciting piece of wearable tech at the show is by far Sony's Xperia Ear Duo device. Closer to headphones than a smartwatch, the Xperia Ear Duo allows you to both listen to music and hear your surroundings at the same time. It works by pumping rings of sound into your ear canal that allow enough space for you to hear those around you. The brand is experimenting with these new ideas rather than a follow-up to 2014's Sony Smartwatch 3. We spoke to Kaz Tajima, Sony's senior vice president of creative design and product planning, about whether Sony would ever look at releasing another smartwatch. "Once we have found the technological innovation - the big step up - we'd like to make a product. Currently, we see just kind of organic improvement of watch solutions, but we think there wasn't a reason to make a completely new product with current technology. "Once we have found the technological innovation, like connectivity, then we'd like to make a new product." We asked Tajima what he believes that technology will need to be like to tease the company back into the space. He said, "perhaps voice commands, or gestures would cover the limited display space. Then we can have a good product with connectivity and people don't have to carry their phone with them. "Just carry the watch, then we can make a new product." Speaking about the specific lack of announcements at MWC 2018 for wearable devices, Tajima said, "As an industry, we are in the learning process to keep giving the end user a reason to buy a smartwatch." Samsung also chose not to reveal a new watch alongside the Galaxy S9 and Galaxy S9 Plus either. 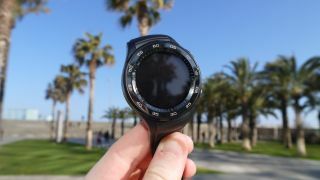 The company seems to be embracing a yearly upgrade cycle for its Tizen smartwatches, the latest being the Samsung Gear Sport announced in September last year. It makes sense the brand didn't bring a smartwatch - like the Gear S4 - to show off. Then there's the lack of both the fitness and style focused wearable brands at the show – why have none of them decided to appear at MWC 2018? It may be because the big names like Garmin and Fitbit seem to be pulling announcements out of major shows and to make separate reveals. Fitbit chose IFA to show off its Ionic smartwatch last year, but the company had already revealed the watch before the show with its own announcement schedule. Fitbit didn't need to hook its announcement onto a press show. The firm knew it'd garner enough excitement and attention just from announcing its first ever smartwatch, so it doesn't need to appear at the show and show off the same products at a stand for MWC. Likewise, Garmin has already revealed two new devices in the last three months with the Vivofit 4 fitness tracker announced separately in December and the Forerunner 645 Music following at CES 2018. Plus if you're looking for a more fashion led watch announcement, you may be in luck in a couple of weeks with Baselworld 2018 starting on March 22 and being the place for the slightly less tech focused and more premium smartwatch announcements. Even though MWC 2018 has been awful for smartwatch and fitness tracker news, that doesn't mean there's not more to come this year if you're a fan of wearable tech.